Conan, I'll follow you wherever you go. Several months ago, I wrote this for ForcesofGeek.com. I'm so sorry that my fears, as it turns out, were very realistic. This is my column from February 2, 2009. "Late Night with Conan O’Brien will soon cease forever, as he moves on to take over for Jay Leno on The Tonight Show. I’ve been wondering how Conan will adapt and whether or not it will affect his whole, shall we say, “vibe”. I wonder if he’ll be able to keep that trademark randomness in his monologue and sketches. I fear that the 11:30 crowd might not “get” Conan the way his current fans do. I fear our pale force hero will get a permanent sunburn living in California. In fact, I fear a lot. I’m pretty neurotic when it comes to change. I’m like the female version of Billy Crystal from When Harry Met Sally. Only I manage to find time to fixate not only on my own impending demise and the state of the world at large but also to worry about famous celebrity talk show hosts and how they’ll weather a change in time slot or a new city. It’s all selfish really, I think Late Night with Conan O’Brien is a near perfect specimen of a talk show. I don’t want it to change. I can just picture Conan sitting in front of some kind of stuffy network tribunal while they analyze his past work like a bunch of corporate John Maddens. Telling him what has to be cut now that he’s on at an earlier time, trying to make him more marketable or accessible or some garbage like that. At first, I thought there should be some kind of crash course introduction to Conan for people who aren’t yet acquainted with his style. Like one of those recap shows they do for LOST. The fundamental concepts of Conan’s humor could be covered in a handy little tutorial. Then I thought maybe NBC should release some kind of public service announcement recommending that people buy or rent the DVD of Conan’s 10th-anniversary show. Then I freaked out when I heard Jay Leno was going to have a show in primetime right before Conan, thinking it would keep new viewers from becoming acquainted with him. At first, I thought it was insulting. It felt like they weren't really promoting Conan, just pushing the schedule up earlier. But I definitely do say that now, fairly often actually. Next thing you know I’ll probably be complaining about how they don’t open their doors soon enough for the early-bird special over at Denny’s. Even if my habits are changing with my age, as is bound to happen, my sense of humor is managing to stay the same. (Yes, as stale as ever with no signs of change.) So I have to believe that even though Late Night has only been playing in a small theater big enough for 200 people for the last 16 years that his fan base has snowballed during his tenure. As much as I fear the changes that have to come from Conan moving from New York to L.A., from 12:30 to 11:30…there’s a lot about the move that's really starting to excite me. I’ll be able to watch much more often now. And why should I begrudge Jay Leno getting a 10:00 show? That just means his loyal viewers get to watch him when maybe they’ve been falling asleep in their chairs trying to make it to The Tonight Show. Just the way I typically can no longer make it to Conan. So...kindness and understanding. I guess. I’m also remembering a time recently when I sat one of my sisters down to show her Conan’s 10th-anniversary special. That’s the DVD we put on when we have parties or company. I find myself talking to people about it as though I'm trying to win them over to the Hare Krishna cult. She’s about eight years older than me and she laughed hysterically. The entire way through, which just goes to show, good comedy knows no age restrictions. In other words, I believe he'll transfer. Besides, I’ve got more important things to worry about right now. Like what I’m going to do about the fact that David Letterman and Conan are now on simultaneously. Pardon me while I go ponder the futures of all the employees over at Worldwide Pants. *Sigh* Now I begrudge both Leno and his fans, and I begrudge them HARD. 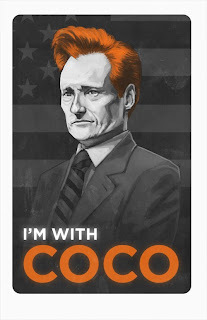 No matter what happens, I really will follow Conan, and my only hope now is that he stays on the air, some way, somehow. You'll rue the day NBC. Rue it, I say! READ Conan's official statement here. This man is a class act ALL the way.